The HCSM Directory, created earlier this week, it aims to provide a listing of all those participating in HCSM chats across the globe. 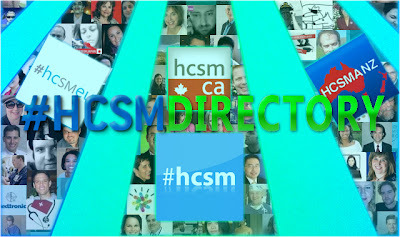 The directory to date contains a list of participants from #HCSM, #HCSMEU, #HCSMANZ, #HCSMCA, #HCSMLA, and many more. Participant's twitter username, country, chats they participate in and any other information they feel like divulging, is listed. The HCSM Directory is open to all, and feel free to add your details. I hope that this initiative will grow so that, people all across the world can connect with like-minded individuals. Don't forget to checkout HCSM Global, which aims to join all chapters of health care social media around the world in one place.